(MP442). Oil on board signed Richard Cosby and dated 2016. On 14 January 1986 Her Majesty’s Yacht BRITANNIA, wearing the flag of the Flag Officer Royal Yachts (FORY), Rear Admiral John Garnier CBE LVO, was on passage to New Zealand for Royal Duty with HM The Queen. HMY, approaching the southern end of the Red Sea, was signalled that fighting between the Government and rival Marxist factions had broken out in the former British Colony of Aden, now the Peoples’ Democratic Republic of Yemen. The intensity of fighting now threatened the safety of foreigners in the country and with the full agreement of Her Majesty, BRITANNIA proceeded to the Aden area and prepared to evacuate British and Commonwealth nationals. 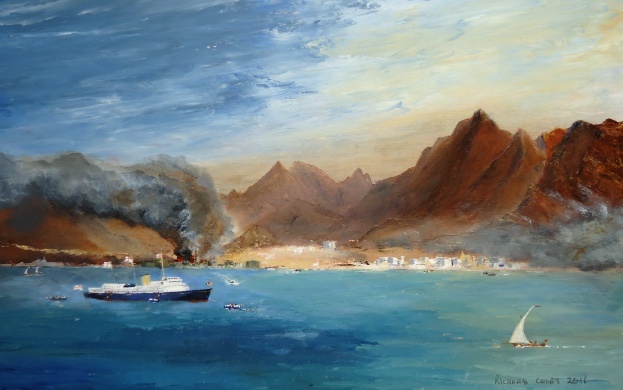 The Royal Yacht arrived off Aden at first light the next morning to find a very confused situation with fierce fighting within the port of Aden itself and in the close vicinity. In the early hours of 17 January FORY was joined by the destroyer HMS NEWCASTLE (Captain P J Erskine RN), the frigate HMS JUPITER (Commander R A Y Bridges RN), the fleet tanker RFA BRAMBLELEAF (Captain O G Lynch RFA) and the surveying ship HMS HECLA (Commander C F Heron-Watson RN) from East Africa. MV DIAMOND PRINCESS (Captain C Burtinshaw MN) joined soon afterwards on loan from Cunard. A frustrating constraint was a prohibition from ashore on warships and RFAs entering territorial waters (12 miles) to avoid any chance of provoking the battling elements around Aden. During the afternoon of 17 January, however, it became clear that an initial evacuation should be possible from Abyan Beach, near Khormaksar, north of Aden. With white ensigns flying conspicuously to emphasise her nationality, BRITANNIA anchored as close as possible off the beach and was quickly involved in the rescue effort with Soviet ships. Using 5 of her 6 boats (the Royal Barge remained at the davit head) the Yacht started lifting people from the open beach but with heavy surf making boat embarkation precarious it became obvious that in the very difficult conditions ashore it would not be possible or humane to attempt to evacuate selectively. The 152 eventually embarked in BRITANNIA by midnight were of 26 different nationalities, and once fed they settled down with relief in the Royal Dining room and Drawing room for passage to Djibouti. At first light on 18 January and now alone off the beach, the Royal Yacht started the evacuation again, but this had to be suspended after 3 hours when rebel forces with tanks appeared on the beach and opened fire at Government positions over the embarkation point. Subsequently, shrapnel or shell splashes were observed falling between HMY and the shore. With little prospect of a further safe evacuation that day and after transferring 81 French nationals and a dog to the French ship JULES VERNE, HMY proceeded to Djibouti to disembark the remaining 350 evacuees: the following day NEWCASTLE transferred a lamp post to BRITANNIA who passed it on for the convenience of JULES VERNE’s dog! Meanwhile JUPITER's boats marked out an embarkation area on a featureless coast near Zinjibar (about 40 miles NE of Aden) which allowed the Royal Yacht, arriving after dark, to recover 209 refugees by boat for transfer to JUPITER for fast passage to Djibouti.